Bringing the Montana Home « R-V There Yet? While we were near Indiana, we decided to head over to the Keystone factory and get a tour of the facility where they make Montana 5th wheel, our home on wheels. On the way, we stopped in at a McDonalds in LaGrange, IN and found ourselves in the backyard of Dometic, the manufacturer of many RV products such as refrigerators, air conditioners, toilets,etc. 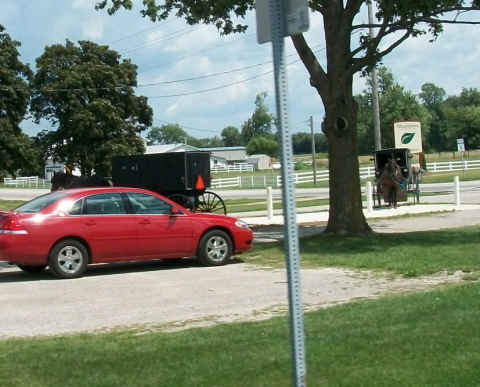 Leaving LaGrange, we spotted a number of Amish traveling in their wagons. This entire area is very heavily populated with the Amish. When we arrived at the Keystone RV plant, which is actually in Goshen, IN., we pulled into the driveway and found our way to the delightful Brittany in customer service. We made arrangements with her to stay in one of their four visitor RV sites. Brittany also arranged for Denise, a customer service technician, to visit us in our rig, the next morning, to discuss some pending service questions. We had noticed that the tires on the Montana were demonstrating excessively wear on the inside of each tire. Denise set us up for an immediate appointment with a local dealer, Tiara RV, to have our alignment checked. It turned out that all of our springs were flattened, We’re not sure whether it has been from overweight or from rough roads. Perhaps having the “G” rated tires has added some excessive stiffness to the system. For most of our travels, we have had a generator hanging off the back of the rig. Perhaps that played a role. We’re not sure. Even though we are full time, we’re not excessively loaded. We don’t collect rocks or anything and we have removed the generator and left it in Texas. The people at Tiara RV are great as they set us up for the night at their place so they could start our spring replacement in the morning. Unfortunately, the axle folks don’t supply a heavier duty spring for our application, so they went with an original replacement. They ordered the parts and promised to have us on our way by noon the next day for a mere $950.00. Unfortunately we missed the plant tour at Keystone because of this, but we thought that the repair was more important. The next morning, while we waited, we had breakfast at Cracker Barrel. While wandering around, we spotted a place called The Dually Depot and decided to stop and have an alignment performed on our dually truck. These folks have a large business and cater to all of the people who haul the trailers to the dealers and are real professionals. Have you ever heard this? “Sorry, we can’t align it because your ball joints are bad.” Well, $1,035.00 and 5 hours later, we were on our way back to pick up the 5th wheel and we finally got on the road by 6:00 PM. We had to make up a day because we had firm reservations in Connecticut that we needed to make. By 10:30 PM, we had knocked off about 250 miles and stopped at one of the wonderful rest areas along the Ohio Turnpike. We pulled in, fueled up and found one of the “Handicapped” truck parking spot which allowed for space enough to send out our bed slide-out. We spent the night there and hit the road again about 9:00 AM and were back on schedule, at the Pocono Vacation Park, by evening. Watch the eastbound 5% downhill grade that continues for 5 miles just before you get there. I-80 had been very well maintained until this point, but this downhill section is extremely rough. This entry was posted on Friday, August 7th, 2009 at 4:03 am and is filed under Indiana. You can follow any responses to this entry through the RSS 2.0 feed. You can leave a response, or trackback from your own site.